Home > How does a radial piston motor work? How does a radial piston motor work? Our SMA radial piston motor is used globally to power heavy duty, high power equipment. Here’s your chance to find out more about how a radial piston motor works. When was the SMA radial piston motor developed? The SMA radial piston motor was developed in the 1980’s to provide power to heavy duty applications. The design incorporates a hardened steel shaft supported on taper roller bearings as part of a hydrostatic drive system. Therefore the oil does the work to power the motor. The motor function is achieved through five pistons, which are carried radially in a cylinder block, mounted on the driveshaft, which incorporates an offset from the centre of rotation. Hydraulic fluid under pressure from a pump is fed to each piston through fluid paths in the crankshaft. 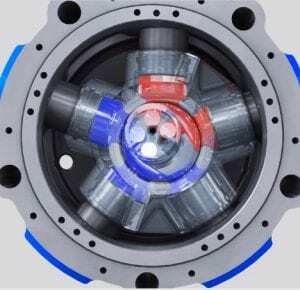 Pressurising the pistons with direct hydraulic pressure from the fluid, when combined with the offset drive shaft, produces a turning movement. This turning motion creates the mechanical power which drives the application. 1. Oil is pumped into the motor. The red represents pressurised oil supplied to the motor and the blue is the used oil coming out. 2. Inside the motor you can see the section of the shaft which is offset from the centre of rotation. This is a key design feature to enable the motor to operate. 3. The red fluid represents the energised oil which pressurises the pistons to turn. The blue fluid represents the used oil coming out of the motor. 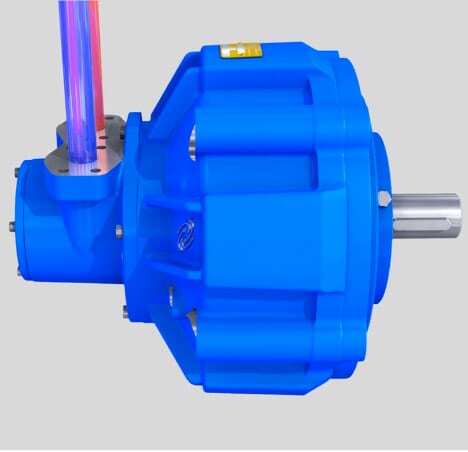 Where is the SMA radial piston motor used? The SMA motor is used to power heavy duty equipment in high power applications. Typical applications include trenchers used to dig 10 foot deep channels to lay electrical cables and pipes for drainage, as well as terrain levellers, which are used to quickly demolish road surfaces, prepare a site for construction machines or complete surface mining. 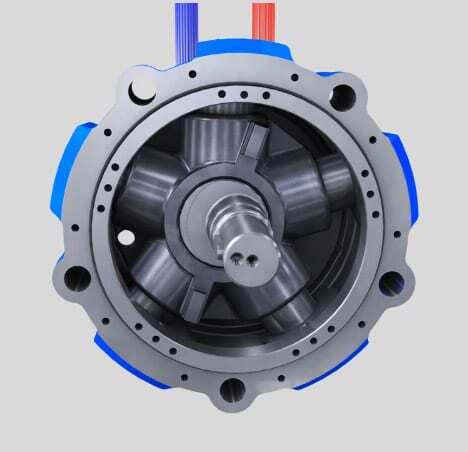 The SMA motor is perfect for these applications because it can withstand high mechanical and high hydraulic shock loads, offering excellent life and continuous high power use. The speed and power ratings are also significantly higher than other motors available in the market. What is the range of sizes? The size of the SMA motors range from 100cc (weighing 30kg) to 16,400cc (weighing 2,500kg). A motor’s cubic centimetre (cc) is the measurement of the motor’s displacement, which means the volume of oil that it takes to turn the motor once. Contact us if you would like to find out more about our SMA radial piston motor.